Technology: Sheet Metal Fabrication Services are metalworking services that produce sheet metal goods through cutting, bending, rolling, forming, stamping, and welding of sheet metal. Typical products include enclosures, guards, brackets, etc. Some vendors specialize in particular industries such as aerospace. Unlike metal fabrication, sheet metal fabrication does not necessarily imply welding or brazing together of individual pieces, though it can. Rather, sheet metal fabrication will often form parts using many bends, or by drawing it, or by cutting, punching, and shearing it. Often the finished part has been produced with a combination of these methods. Complex fabrications are often made by combining simpler shapes through riveting, welding, brazing, or fastening. Adavntages: Sheet metal fabrication services can produce specialized sheet metal forms using tools that might not be readily available in conventional machine shops. 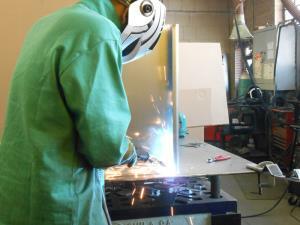 Applications Sheet metal fabrication services are used in a variety of industries from aircraft to utilities.